From “Mirror of the Contest of Courtesans of the Genroku Era” Only two original copies of Masanobu’s famous woodblock print work Genroku Tayū Awase Kagami have been preserved. The five prints in the Geyger Collection are from the Verver Collection and originally belonged to the complete edition in the Drukker Collection, which consisted of 16 depictions of courtesans and a picture of a beauty being accompanied by a samurai (a client). 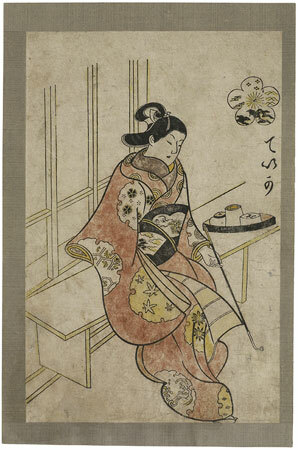 The courtesan Teika is leaning against a bench holding a long pipe in her left hand. Next to her there is a round lacquered tray containing various utensils. Her kimono displays blossoms and leaves in snow-crystal shaped patches, while her obi is decorated with fan ornamentation. Masanobu created the figure of teika from three different courtesans in Torii Kiyonobu I’s Keisei-ehon. The way she holds her head and the position of the sleeve correspond to the courtesan at the end of the colophon. The lower part of the kimono is similar to that of the courtesan Hatsugoe, while the pipe and the tray are taken from the illustrations of the Hanamurasaki.